Looking for a gift for the hard-to-buy-for sorts on your list? Hat City Ball tickets are the perfect choice. It's a great evening of dining and dancing--a real rockin' shindig! !--that supports the Danbury Museum. This year's theme is a sock hop, so get your glad rags on--anything from poodle skirts and saddle shoes or your best James Dean leather jacket to all glammed up--and join us for the best party of the new year. Enjoy an open bar of beer and wine, a fine selection of hors d'oeuvres, surf & turf dinner (vegetarian option available), and delicious dessert followed by music, dancing, and a raffle with great prizes! Danbury's own Mike Caravakis will be our fabulous DJ for the evening. Dance to the original hits of the 50s and 60s with us as Mike spins 45s and LPs for an evening of great dance tunes. 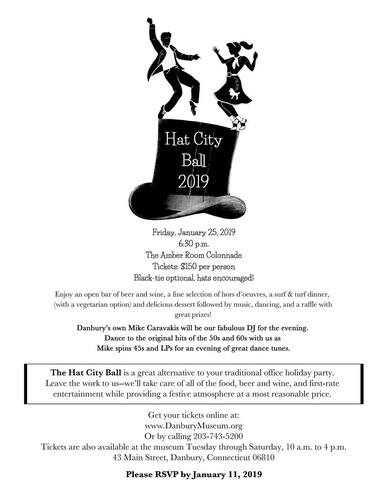 The Hat City Ball is a great alternative to your traditional office holiday party. Leave the work to us - we'll take care of all of the food, beer and wine, and first-rate entertainment while providing a festive atmosphere at a most reasonable price.